I was asked to do a card demo in July and my mother-in-law took some of my cards to show the ladies. 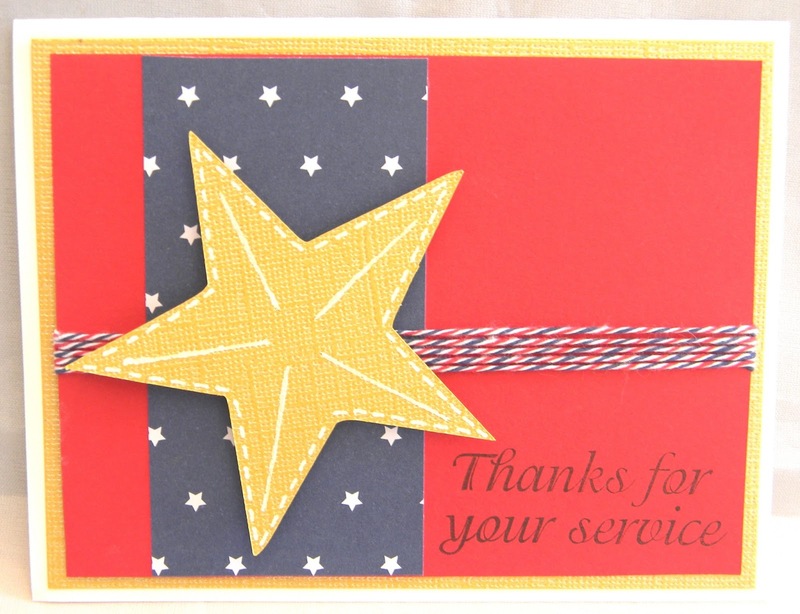 One of them asked that I make 12 cards for her to send to a troop for the June package she is sending. I spent an entire Saturday trying to come up with something and this is what I ended up with. Sorry the picture is not exactly the best. It was cloudy and now the cards are on their way. Be sure to stop by the Trendy blog all month to see the fun projects this month. Have a fabulous day!! Nice card for a great cause! 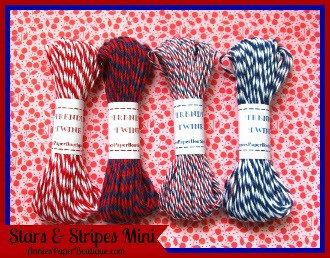 Hope you will stop by and link up at Craftin Desert Divas “Red, White & Blue” Linky Party. This is so pretty, Helen, and for such an awesome cause. I bet the troop will love getting these. Love the big star, too. Great patriotic card. Love the twine colors! Your card looks great, love the patriotic theme with the pop of yellow. What an AWESOME card!! I know this will be greatly appreciated!!! Another FAB Trendy Twine project!! This is SOOOOO adorable!!! Love that stamp!!! Thanks for Crafting it Up and Linking it Up at Craftin Dessert Divas! This is Awesome. Love it my friend. Great card! Thanks for linking up with us at Craftin' Desert Divas, Helen! !